7.5x55 ammunition, also known as the GP 11, and is commonly known to military surplus enthusiasts as the Schmidt-Rubin round. The unofficial nickname comes from the fact the round was designed for the Swiss Army, and their Schmidt Rubin Model 1889 rifle. The GP 11 came about after a series of different experiments with similar cartridges, and ended after metallurgy advanced far enough to allow more powerful rounds. 7.5x55 Swiss ammo served in the Schmidt Rubin rifles, as well as Swiss service machine guns of the time. The Swiss cartridge was oddly enough a paper patched round, similar to musket rounds from centuries prior. This was supposedly done to aid in the gas seal of the cartridge. The round was completely non-corrosive, and this made somewhat unique in Europe at the time. 7.5 Swiss served nearly a hundred years and was chambered in shorter carbines, and the more modern Stgw 57 battle rifle. The round was superbly accurate and very powerful. The cartridge was capable of achieving 2,400 feet per second with a 200 grain projectile. The standard military round was a 174 grain projectile that feature exceptional range, capable of reaching out to nearly 900 yards at supersonic velocity. 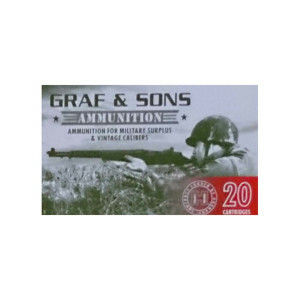 Popular in Europe and as an American military surplus collectors round today, you can find 7.5 Swiss ammo for sale listed below. 7.5x55 Swiss ammo is excellent in my K31. Three shots in same hole at 50 yards with open sights. Next three were 75 yard range with three holes able to be covered with a nickel. Nice bang for the buck and reloadable brass as a bonus. Best ammo I’ve shot in my K31. FMJs aren’t allowed at most ranges I shoot at, so this is what I shoot and it’s amazingly accurate and easy on my shoulder compared to 8mm Mauser and .45-70, which I use for hogs here in Texas.